Following an invitation by Komatsu Germany GmbH, Düsseldorf/Germany, North Rhine-Westphalia´s State Minister for Economic Affairs, Digitalisation, Innovation and Energy Prof. Andreas Pinkwart visited on 22nd August 2018 the Kalkwerke Oetelshofen quarry in Wuppertal. Together with the members of the company management of Komatsu Germany GmbH, Taiichiro Kitatani, Ralf Petzold and Göksel Güner, the minister learned about the use of digital technologies in modern mining operations, e. g., with data acquisition and analysis on a construction site of the future. 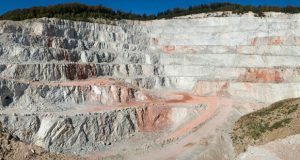 At the same time, the minister was also given the opportunity to operate a 400 t hydraulic excavator (Figure 1) in the quarry. In the future, Komatsu Germany GmbH will be able to react even faster and more flexibly to customer requirements due to strengthened cooperation between the two sites in the fields of production and development. And with this step, the brand Komatsu will also become stronger in Germany and Europe. 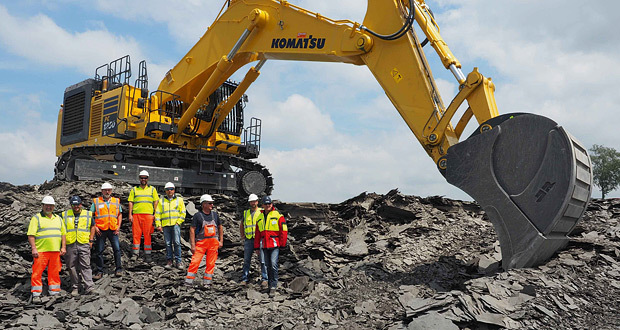 The site in Düsseldorf-Benrath is responsible within the Komatsu group for the development, production and marketing of large hydraulic excavators for international mining. Through continuous product development and innovation with a focus on quality and reliability, the name is synonymous with top quality around the world.